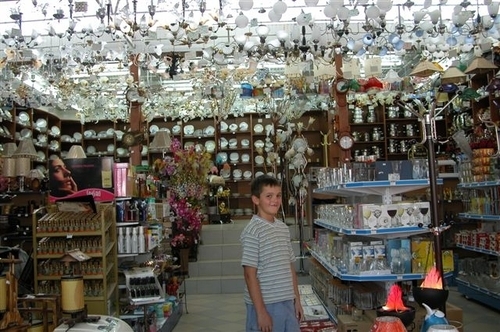 Ken Corey - Our Man in Macedonia, 2008: 17 - Lamp Shop in "Plastic Alley"
17 - Lamp Shop in "Plastic Alley"
Carole writes, "I had an outing with some other wives from the U.S. Embassy. These next pictures are some of the things that I saw right here in Skopje. This first picture is taken at an area of town called "plastic alley" but as you can see from this shop, it's much more than just plastic. This is a fun strip for the ladies to shop. This little boy was the owner's son and he was more than willing to pose for my shot. Plastic alley is probably 6-7 blocks long on either side of this busy street."